The Process: Hair grows in three stages; only those hairs in the growth stage will respond to the laser. A hair’s pigment, the substance that gives hair its color, absorbs the laser energy and converts that energy into heat that permanently destroys the hair follicle, making it unable to produce hair. So, you see, we actually are not removing hair, we are permanently reducing the number of follicles that are making hair. Your first visit: Is typically a consultation. Most patients start their first session of laser hair removal during this visit but that decision is entirely up to you. They review your medical history and ask a few questions that are important to anyone considering laser hair removal. They will explain the process with you and answer any questions you may have, so please feel free to jot them down and bring them in with you. In advance of your visit, you should shave the area they are to treat with the exception of facial and neck hair in women. They like to see those “problem areas” first, and then they will give you a razor to use in their treatment rooms before they begin the laser hair removal session. For bikini line hair removal, shave the area as you would like it to look when the treatment is finished. 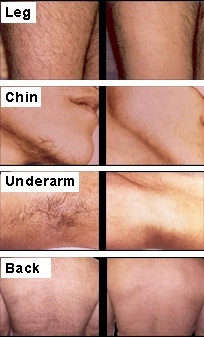 A typical laser hair removal session lasts under an hour. Facial hair is treated in about 10 minutes, while it takes about 45 minutes to laser both legs, and 30 minutes to treat the entire back. Bikini areas usually take 10 to 15 minutes. Many patients describe the laser hair removal sensation as a rubber band hitting the skin, but most say it’s better than waxing. The number of sessions for laser hair removal: Depends on various parameters, including the area of the body being treated, your skin color, coarseness of hair being treated, and your gender. In addition, since hair grows in several phases and the laser can only affect the current actively growing follicles, several sessions are needed to kill hair in all phases of growth. In general, normal practice is between 3 – 8 treatment sessions. Coarse dark hair on light skin is the easiest to treat. Finer hair and hair on darker skin is harder to treat and may require more treatments. Certain areas (notably men’s and women’s faces) may require considerably more treatments to achieve desired results. Time In between Laser Hair Removal Sessions: Usually, treatments are spaced 3-12 weeks apart to start, although the spacing depends upon individual response to treatment. Instead of following an arbitrary schedule, you should wait until you have experienced shedding of the treated hairs, which should complete within 2-3 weeks, and see enough hair come in after the hair-free period to have another treatment. Treatment spacing also depends on the area treated as hair cycles vary based on the body part. For example, women’s faces usually require more frequent treatments, whereas backs and legs require less frequent treatments. Risks of Laser Hair Removal: Can include the burning of the skin or discoloring dark skin with the laser, hypopigmentation (also known as white spots), and flare-up of acne. SkinStore carries a variety of Natural Skin Care Products. Look for the green leaf icon to identify our Natural Skin Care Brands.